A Cincinnati teenager's trip to Santa's Wonderland today did not turn out as expected. 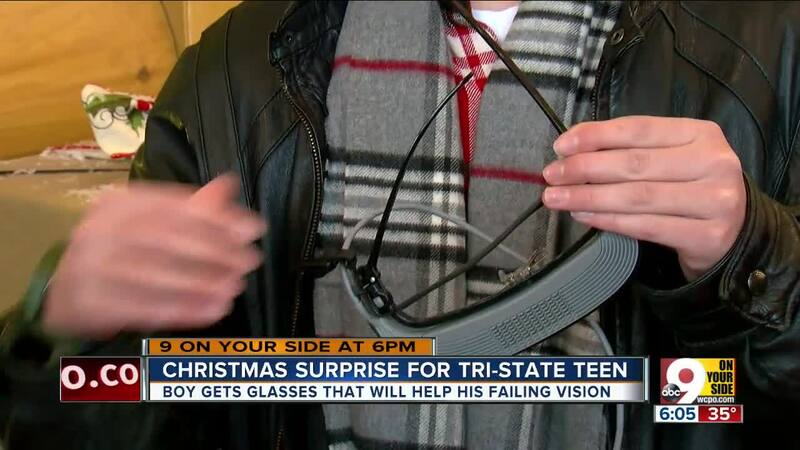 13-year-old Carlo Averion showed up, and received a life-changing gift: digital glasses to help him see again. Averion suffers from Stargardt's Disease, a progressive disease that's causing him to lose his sight. The disease causes macular degeneration, and currently there is no cure for it. The glasses are manufactured by a company called E-Sight, and their website claims the glasses work through a mix of optical and computer technology "to stimulate he remaining photoreceptors in your eyes, sending more information to the brain and enhancing your ability to see clearly." These glasses were purchased with a combination of donated funds and grant money. "We have people that donated and we don't even know who they are, and we're very grateful for their generosity," said Lisa Averion, Carlo's mother. "When school starts back up, I just want to sit at my desk and read something on the board," he said. "It's really just the small things that I want to look at that people normally take for granted in life." The glasses were provided for Carlo thropugh donations, and a grant from the First Hand Foundation, a non-profit that helps provide children with health-related needs.